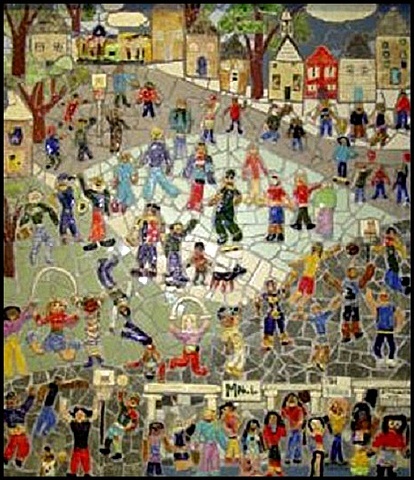 A mural at F.S. Edmunds School in Philadelphia, was sponsored by the PAEP and the Philadelphia School District. Schools that had no art teacher in the school were targeted for the residencies. I was working with two second grade classes whose mural depicted what they liked to do when not in school. When I first started working with the children, they could only draw stick figures. We met one day a week for 8 weeks. The kids made the tiles: full figure self portraits in action, houses and trees which was composed with broken commercial tiles. The mural hangs in the hallway next to the main office.